Speaking and listening skills are very considered very important, especially since we have a high EAL (English as another Language) proportion of children. Children are encouraged to listen, take their turn in discussions and are given opportunities to develop confidence and the ability to express themselves clearly in a variety of situations e.g. class assemblies, role play, talking to the class about their hobbies and interests, reporting and storytelling. Reading is taught by a combination of sound and word recognition. We use ‘Letters and sounds’ – a system of phonics teaching – to give each child a sound basis for acquiring both reading and spelling skills. All children follow a structured reading scheme, which is colour-coded (banded) for different levels of difficulty. The reading scheme uses Oxford Reading Tree scheme as well as a variety of ‘real’ books. In the early years, sounds, words and reading books are sent home so children may share reading with their parents. We ask that parents talk about the pictures, read story and then listen to your child read the same story. The book is kept for at least two days so please remember that this repetition is VITAL to help develop comprehension skills. To develop comprehension, you can use the question provided below. Another educational activity when reading with your child is to change the story line slightly, instead of the story taking place at home, it could take place in a castle or in a cave and then the characters could also change. This activity will build up their creative writing skills as they are starting to make up their own stories based on a known storyline. There are daily opportunities for reading and there is ready access to books. As children become more confident and independent they are encouraged to read other fiction and non-fiction available from our school library. Progress is carefully assessed and recorded. Guided FICTION or NON-FICTION reading questions you can share at home. We use the DfE’s Letters and Sounds Phonics Programme in school which is extended using recommended resources. Systematic phonics teaching is based on Letters and Sounds. This is embedded in a 20-minute phonics session for the Reception and Key Stage 1 classes at 11.30am every morning. The sessions are rigorously structured and taught in an engaging way, taking the children through a sequence of phases of phonic development. grapheme/phoneme (letter/sound) correspondences (the alphabetic principle) in a clearly defined incremental sequence. to apply the highly important skill of blending (synthesising) phonemes in order, all through a word, to read it. to apply the skills of segmenting words into their constituent phonemes to spell, that blending and segmenting are reversible processes. Their reading is consolidated by the books and activities used in the rest of the curriculum. Boxes of banded reading resources are available in every class and children are encouraged to choose books from both class and school library. Skills in grammar, punctuation and sentence construction are taught separately and are developed in creative writing sessions. Spelling is taught in a systematic way and spelling tests are an integral part of the development of correct spelling. The school teaches the spellings laid out in the New National Curriculum 2014. Handwriting skills are practised regularly and correct orientation is taught from Reception onwards. In Reception the children print words and then start to join them in Year 1. It is essential to orientate each letter correctly. We also ask parents to encourage their child to write their name in lower case letters with only the first letter in capitals. 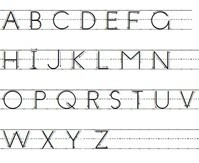 To help your child develop their handwriting you can download the following handwriting pages.